No to NATO — Yes to Peace Exhibits - World Beyond War . . . The Sanctuaries will host a live screenprinting station, where attendees can screenprint their own art for the nonviolent demonstrations the following day. We’ll make small peace flags and wearable art, like bandanas and patches. This live screenprinting station is a continuation of the half-day Screenprinting for Justice Workshop, hosted by The Sanctuaries earlier in the day. Register for the half-day workshop here. The 12:00 p.m. – 4:00 p.m. workshop introduces the medium of screenprinting to explore effective messaging in promoting social change. Participants discover their own motivations for civic engagement, learn about the power of language in strategic messaging, and collaborate on a screenprinting project for the No to NATO demonstration. 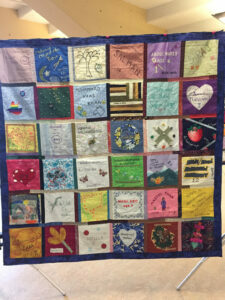 Drones Quilt Project: The drones quilt project is a traveling exhibit of quilts that memorialize the victims of U.S. drone warfare. The names humanize the victims and point out the connectivity between human beings. According to the Bureau of Investigative Journalism, only about 20% of the drone victims have been identified, so there are many, many victims whose names are not known. 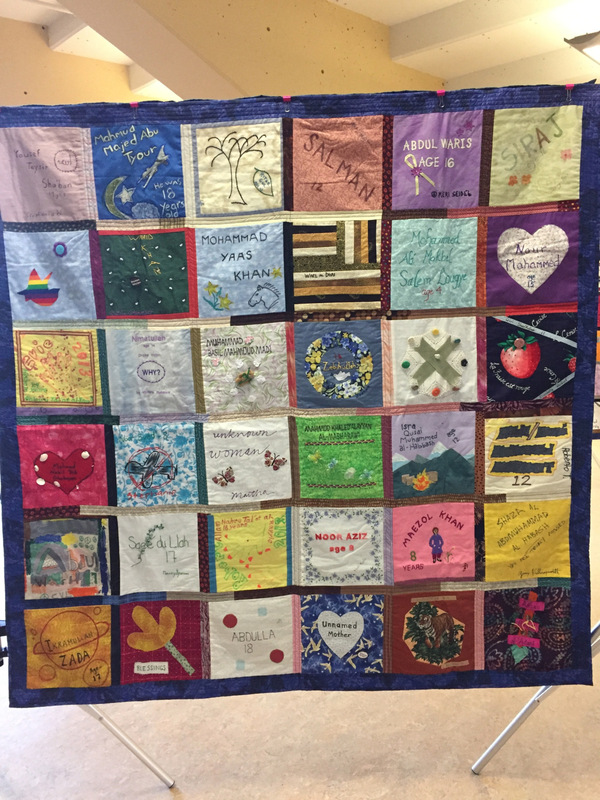 We are remembering these unnamed victims with quilt blocks that say “Anonymous,” “Unnamed Woman,” “Unnamed Man,” or “Unnamed Child.” The important thing to remember is that each victim was a human being, with hopes, dreams, plans, friends and family. 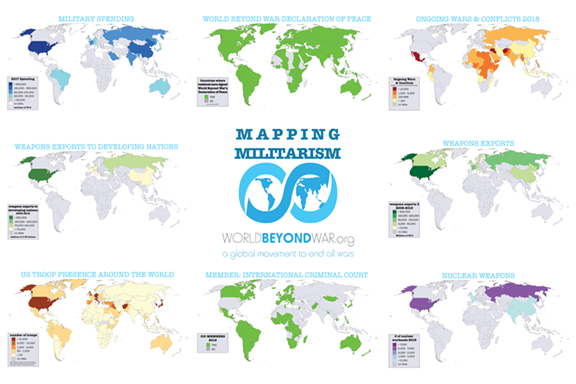 Mapping Militarism: World BEYOND War’s unique exhibit of 9 high-quality graphic posters mapping militarism around the world. We map out military spending, weapons exports, U.S. troop presence, ongoing wars, nuclear weapons, and more. 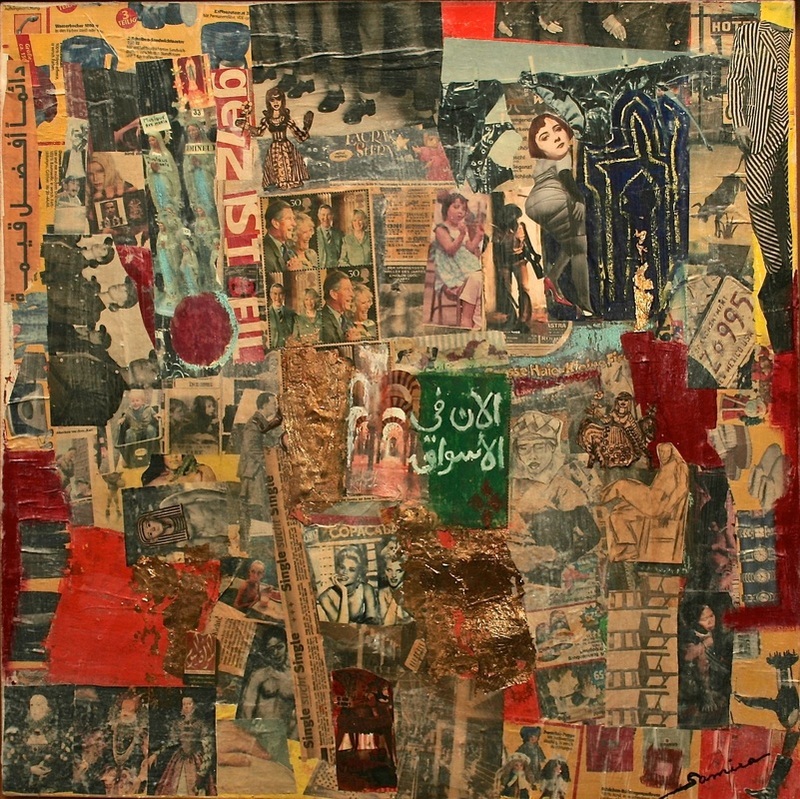 Collage art by Samira Schäfer: Orient meets Occident. Sometimes sarcastic, almost cynical, but always provocative, Samira Schäfer refers to reality, cruelty, violence, the abundance of the consumer world – the screaming injustices – but always there is her humor, which shines through, mixed with sarcasm, and sometimes it is simply denouncing. She takes the right to judge. Her works creates tension, it provokes and composes. Samira Schäfer grew up in Damascus, Syria, went to a French-language school there and then studied French literature. Since she was only briefly enrolled in the Damascus Academy of Arts, she describes herself as an autodidact. In her art, as well as later in her name, the centuries-long tensions between the Orient and the Occident are present. Unfortunately, the timeliness of this dichotomy is currently screaming. 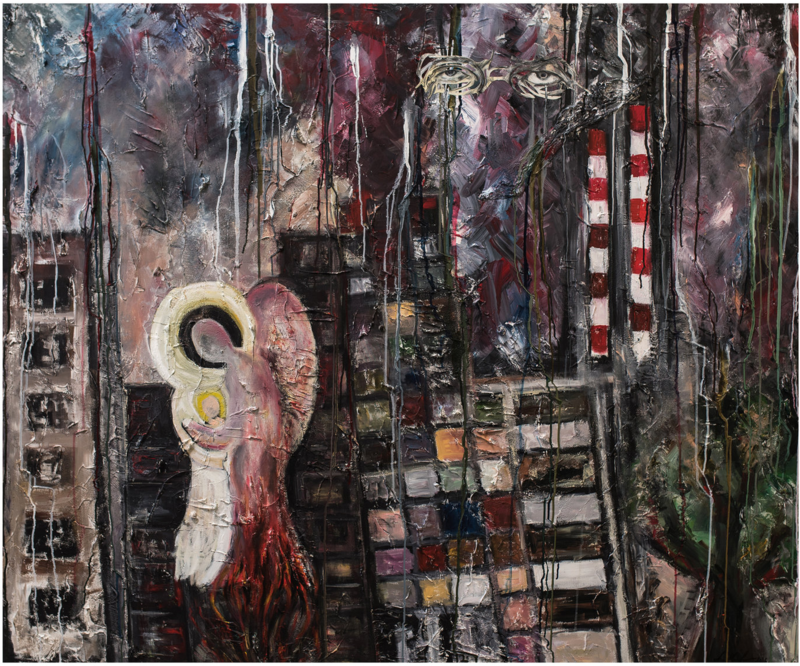 Samira Schäfer came to Berlin in 1969 and resumed her artistic work 20 years later. 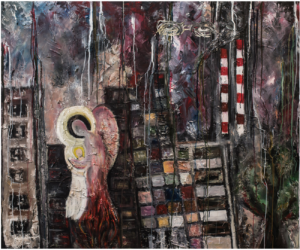 She has exhibited her art in Berlin, Paris and New York, among other locations. Just World Educational Photo Booth: Grab a prop and snap a photo, or record a quick video, in solidarity with Palestine. This April marks the 1st anniversary of the Palestinians’ Great March of return. We’ll be tweeting your messages in real-time at the event. While you’re waiting your turn at the photo booth, take the #WarHurtsEarth quiz to test your know-how about war’s climate impacts. Quiz BEYOND War & “Where Your Taxes Go” Activity Station: Answer a series of questions to test your War Abolition awareness, and participate in a “penny poll” to think about how our tax dollars are being spent and how we would like them spent. Prizes for correct answers!